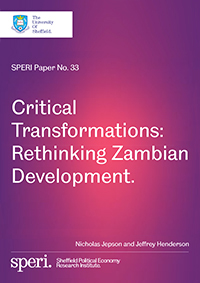 We are pleased to publish this new SPERI Paper by Nicholas Jepson, Lecturer in International Development at the University of Manchester, and Jeffrey Henderson, Professor of International Development at Vrije Universiteit Amsterdam, which seeks to retheorise the trajectory of Zambian development since the country’s independence. It emerges from a larger project designed to break with current discourses and rethink development more generally on the basis of ‘transformation’, with particular attention paid to the circumstances under which periods of ‘critical transformation’ are likely to occur in particular national and subnational contexts. Beginning with an account of the conceptual and epistemological issues associated with this approach, the paper then explores the utility of ‘transformation analysis’ categories via a re-interpretation of Zambian development. It maps in detail the ways in which key enduring vectors of transformation have combined over time, along with a variety of other intervening dynamics and contingencies, to drive the sequences and trajectories of transformation observed in Zambia since independence. Download Paper No. 33: Critical Transformations: Rethinking Zambian Development.